Unwilling to just play it safe and take Environmental Biology for my second science course to meet my baccalaureate requirement, like all other kids who never completely abandoned their "I want to go to space camp," phase-- regardless of being mathematically challenged-- I enrolled in Solar System Astronomy. And sure enough, I barely made it out of there with my GPA intact, However, although I couldn't tell you one specific fact that I learned in class other than I made enough flashcards to have reached at least halfway to the moon for short-term memorization and test regurgitation, I can tell you that similar to my feeling going in, I understood that-- to quote LeapFrog's Tad-- although "counting is hard," to this day, nothing in the world sounds quite as thrilling than taking a trip to the moon. 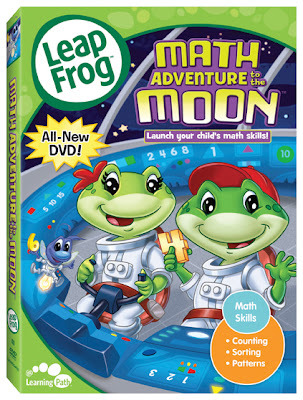 In this high quality "mathtastic" edutainment genre children's DVD, LeapFrog gives viewers the chance to blast off and soar on a rocket through the solar system via hyper-speed. 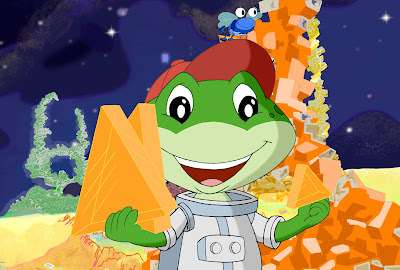 It's an adventure fully powered by the world of math, which we-- along with Tad, Lily and their brilliant pal Edison-- discover is around us from adding up prices at the store to uncovering patterns with shapes and sizes, as well as telling time and playing games. 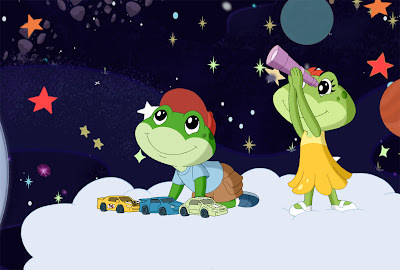 Following its two week bestselling August predecessor Let's Go to School, LeapFrog returns with Math Adventure to the Moon in the acclaimed educational series that should delight children aged three to six with a varying degree of difficulty in its brightly animated, breathtakingly fast-paced journey. Admirably working in story problems you can translate into equations if that's the way you learn best or simply following along with the problem solving quests in the plot, this roughly thirty minute work warms up eager learners with counting and patterns and then brings us along in a frenzy of speed-counting to get us familiar with the order of the numbers. 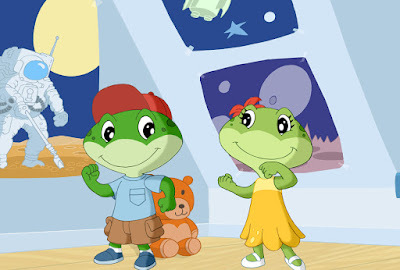 By telling viewers that when you count by twos, fives or tens, the ship just travels faster, LeapFrog is in essence giving us a mental warm-up using animation instead of flashcards and visual cues that go hand in hand with dull repetition. 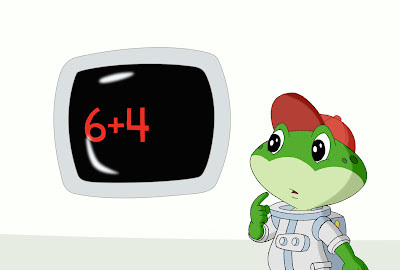 Understanding the fives and tens is an important step for fast learners as Tad an Lily must help equal ten several times over to prepare the ship for its return trip back home by using crystals of differing color, shape and size. Encouraging us to begin recognizing patterns and predicting what will come next along with asking what a step would be after we take away or add something else, children from three to six will no doubt see the dilemmas differently as they get increasingly accustomed to the real puzzles they need to solve. Therefore, the disc should no doubt help prepare kids to do the exact same thing in the future, whether in pattern based IQ tests or once they hit college and decide that dreams of space camp are still in the back of their mind so they enroll in Solar System Astronomy, even if this time around they can't take Tad, Lily and Edison to class.